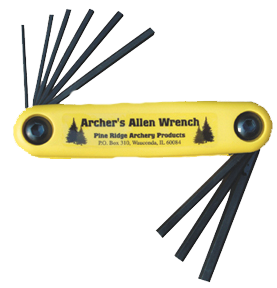 The Archer's Allen Wrench has been the staple item for pro shops and home bowsmiths alike. We now have a second version which has two larger wrench sizes to accommodate the limb bolts on the Mathews and BowTech bows. Guaranteed for life not strip out or round the corners. Includes sizes: 5/16", 3/32", 7/64", 1/8", 9/64", 5/32", 3/16", 7/32" and 1/4".